Some time ago I went to a local stationery store here in Chiang Mai, Thailand, and there, in the middle of the floor, was a blanket spread out, and someone was doing a Thai massage session for one of the people who worked in the store. They must have needed it badly! Nobody seemed to think that there was anything unusual about this picture, and customers simply walked around the impromptu massage setup. When I mentioned that I would like a massage also, everyone in the store erupted with appreciative laughter. Today I went to a restaurant for dinner. There were no customers inside, but an unusual scenario was happening. One of the restaurant cooks was lying face down on one of the wooden benches in the dining area. The other cook (both female) was standing on her co-worker’s thighs and was walking up and down her legs and buttocks while clinging to the curtain next to her to keep her precarious balance. When I walked in on this scene, all the employees broke out into heart-felt laughter. I told them to go right on doing their massage, which they did. The restaurant manager was right there and did not take any issue with his employee’s extracurricular activities. Imagine such a scene in an American restaurant! I have seen similar scenes countless times in Thailand. In all my travels I have never seen any country where spontaneous massage was happening as naturally and frequently as in Thailand. On the higher end there are lots of fabulous spas with gorgeous decors and beautiful settings. There is no valid excuse to not treat yourself to lots of bodywork in Thailand. Massage in Thailand is often a very public and social activity. Since Thai Massage is done fully dressed, there is no need for private massage rooms. Many times people will gather around a massage session-in-progress, chat, eat and watch. Nobody thinks that there is anything strange about that. 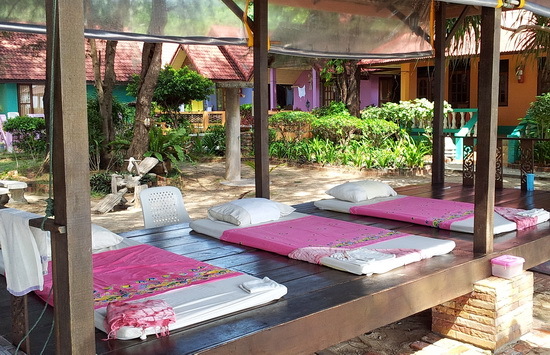 This easy availability of massage is one of the most enjoyable aspects of living in Thailand. Thai Massage is not considered a luxury like in the West. It is often seen as a necessity to maintain good health, and as one of the good things in life that many Thais treats themselves to on a regular basis. Yes I know what you mean, Thai Massage is great!